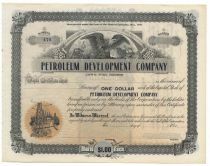 The Petroleum Development Company was the first company to interest the railroads on the Pacific coast in the use of oil as a fuel source for their locomotives. In 1903, the AT & SF purchased the company and its properties. 1---, California. Unissued stock certificate. Black / White. Vignette of an eagle perched atop a rock with a locomotive and steamships in background at top center and a vignette of an oil well at lower left within an orange seal.